"Data Migration in Mergers and Acquisitions"
The Mergers and Acquisitions (M&A) process brings with it a broad range of complexity, from contracts and accounting, to organizational structure and employee protocols. The primary reason many mergers and acquisitions do not deliver longer-term value is because they lack a strong cultural-integration plan. 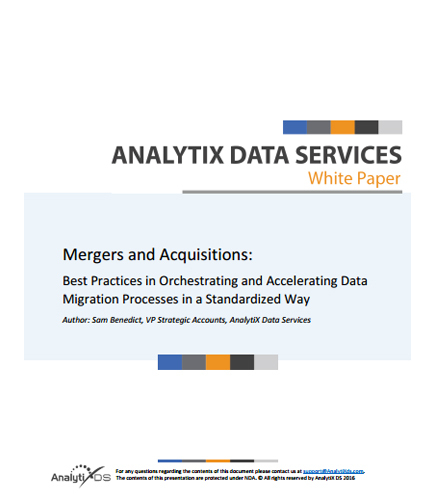 This whitepaper seeks to provide how the data related issues that come with combining disparate source data as is often the case in mergers and acquisitions can be addressed. How to avoid Common Pitfalls in Mergers and Acquisitions? More than 80 percent of all mergers and acquisitions fail. Why? Best tool to standardize the data migration process that can eliminate the error prone and costly manual process in managing complex data migration projects? In this whitepaper, there are few out-of-the-box answers for streamlining this process, and though there are many system integration companies available to help, this can add significant cost and time to the Merger & Acquisition cycle.